If you have yet to watch the show on BBC iPlayer and don't want to know the result, look away now: yay we WON!!! And pretty convincingly too, becoming the first team to knock out each Egghead in the head-to-head rounds and then go on to win the show. Kevin Ashman, the last Egghead standing, who finally fell on a question about cartoons, if you can believe it, said it was "the most comprehensive defeat we've ever had". I like that quote. 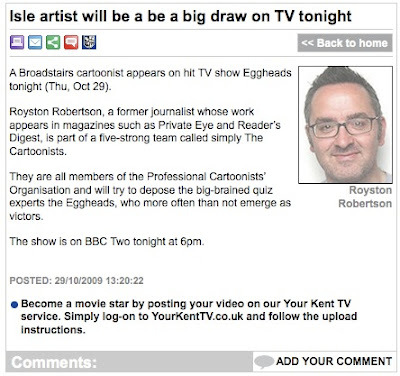 We all drew cartoons and caricatures of the Eggheads beforehand, which we revealed on the show. I drew CJ de Mooi as a Bond villain as that is the type of "Mr Nasty" character he likes to project! He got the joke, luckily, and really liked it. I only found out via a recent episode of Eggheads that he considers himself something of an expert on Bond films, so that was fortuitous. Over at the Bloghorn there's another more detailed account of the Eggheads experience by team captain Alex Hughes: Cartoonists crack Eggheads Can I just say "Yay!" one more time? "And the award for best actress goes to ..."
Christmas is fast approaching so the cartoon gift books have arrived in the shops. And a few of my magazine cartoons make a reappearance in the Private Eye Annual 2009 and the Oldie Book of Cartoons 1992-2009. 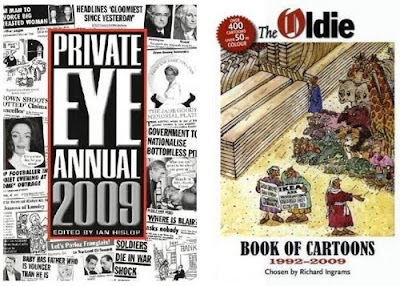 The above, which was in the Eye in January, shortly after Kate Winslet did her thing at the Golden Globes, can be seen in the Eye annual, and the old chestnut below, from 2006, is in the Oldie one. 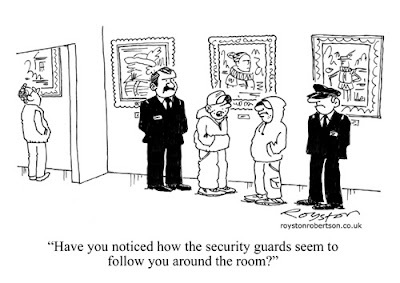 "Have you noticed how the security guards seem to follow you around the room?" 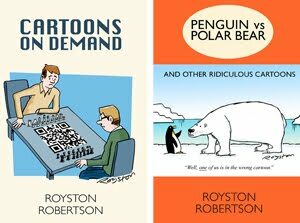 They're the ideal present for the cartoon lover in your life, available from all good bookshops, blah blah blah. Merry Christmas! This just in: Local news! From the website of the Your Thanet newspaper (click image to enlarge). OK, I said I'd remind you nearer the time: I can be seen on the TV quiz show Eggheads tomorrow (October 29th) at 6pm on BBC Two. I'll be appearing with a group of fellow cartoonists from the PCO. 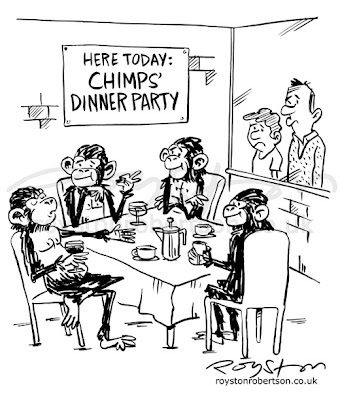 Our team is called, logically enough, The Cartoonists. It was that or something naff like "Drawn to Quizzing"! The Cartoonists, seated left to right, are: Chris Burke, who was on the subs' bench but will not be seen on the show, Alex Hughes, myself, Robert Duncan, Graham Fowell and Martin Rowson. I would say wish us luck, but of course I already know how we did! The show was recorded on January 29th, which means it will have had a gestation period of nine months to the day. I only recently found out that there is an Australian edition of The Spectator, and that sometimes cartoons taken by the magazine will appear there. News has just reached these shores that this one was in an edition of the magazine last month. I hope my friends in Australia won't be too offended that the first thing that sprang to mind when I heard that there was an Australian edition of The Spectator was the Monty Python "Bruces" sketch, set in the "Philosophy Department at the University of Wallamaloo". You know the one: "Bruce here teaches logical positivism and is also in charge of the sheep dip ..."
"Sorry lads, but times are tough – I'm going to have to let one of you go." Is it too late for a recession cartoon? I keep hearing on the news that we're coming out of it, the crunch is over. Doesn't feel like it from where I'm standing, so here's the cartoon anyway. 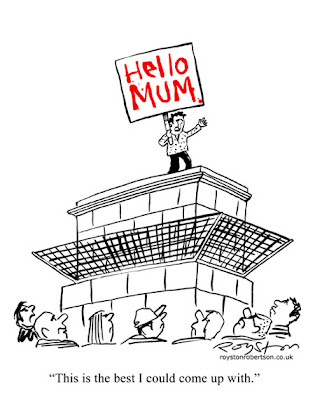 This is featured on a page of gags by me which you can see in the latest edition of the Foghorn, the magazine of the Professional Cartoonists' Organisation. You can read an archive of the Foghorn online, just click the button on the right-hand column of this blog (scroll down). To buy a print subscription to the mag, which comes out six times a year, go here. 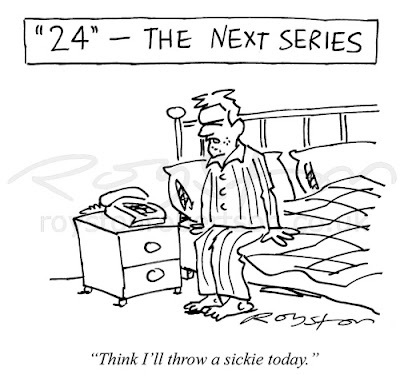 24 – The next series: "Think I'll throw a sickie today." Here's an old cartoon on illness, because I'm full of cold and feeling rubbish. Blegh! Going on a cartoonists' jolly this weekend (to the Wychwood Brewery in Witney, Oxfordshire) so I need to recuperate by then! Back to bed, I think. 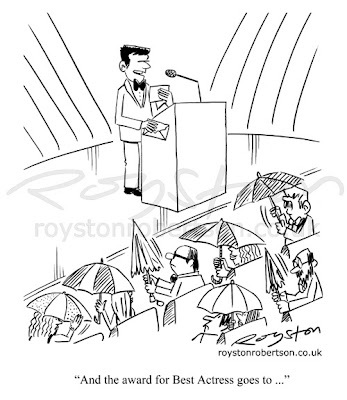 Once again, this week I have taken part in the "reverse caption" competition at the Cartoonists' Club public forum . The caption was "Sorry, no thanks" and I found it a bit tricky. But I've only myself to blame as I set the caption, having won last week. 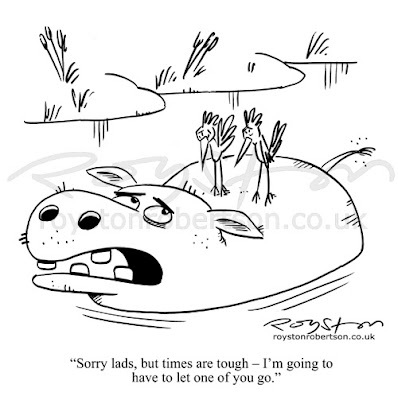 This one is a bit different to the usual gag cartoons I do, but it was fun to draw. And it was another chance to do a topical one. 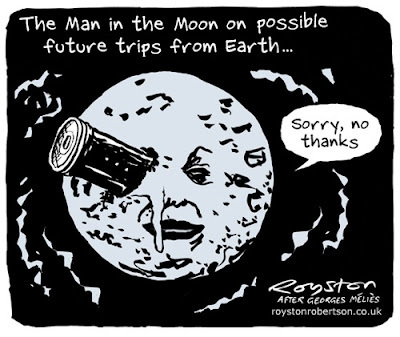 It just occurred to me, when the story about crashing spacecraft into the moon broke yesterday, that it's all a bit reminiscent of the famous Georges Méliès silent film Voyage to the Moon. "Sorry, no thanks" is a phrase familiar to all cartoonists, by the way, as it is often what is written on rejection slips! 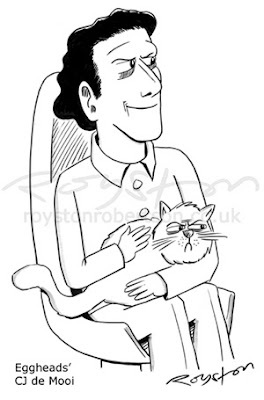 Here's the cartoon I won with last week, the caption was "Right, any more of that and you'll be sitting on the naughty step." Click to enlarge. To me, the word "step" instantly meant Dalek joke opportunity! 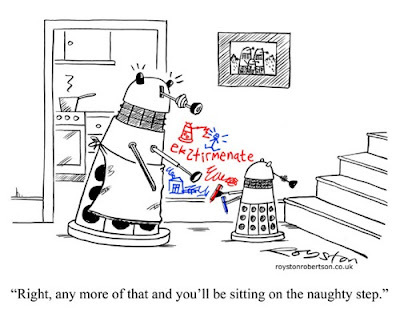 I'm always a sucker for a Dalek cartoon. This next one, from a few weeks earlier, was less successful in the voting. I was surprised as I quite liked it. It was drawn for the caption "This is the best I could come up with" and I include it here as Antony Gormley's living artwork One and Another, which it spoofs, finishes next Wednesday (October 14). 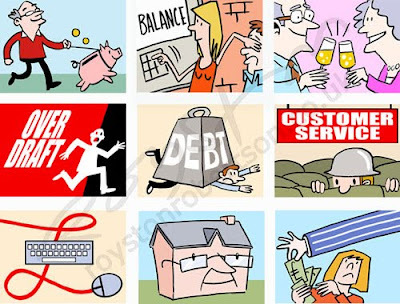 Here's a selection from a bunch of icon-style cartoons I drew for a financial website. They appear on the site even smaller than you see here, so it was a new experience for me to produce cartoons that work in that space. I was given a list of subjects to illustrate: pensions, tax, mortgages, banks, debt, internet shopping and so on. The first thing I learned was that less is more. On the first few I'd put in detail that simply couldn't be seen when I reduced them down. So I had to start throwing things out. In the end, I found that as so little detail was required I could create them entirely on the computer, rather than drawing on paper, scanning and colouring on screen, which is the way I usually work. There was no need to worry about line and certainly no space for elaborate composition. Ironically, considering financial matters are not my strong point, I found this to be a fun job. 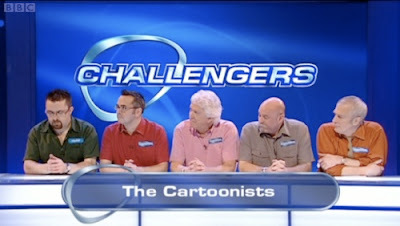 You may, or may not, remember that I mentioned on this blog back in January that I took part in a recording of the TV quiz show Eggheads with a group of fellow cartoonists from the PCO. Well, we finally have a broadcast date. Pictured above are our team, left to right, Chris Burke, our sub in case any of us fell prey to sudden illness (or stage fright), Alex Hughes, myself, Robert Duncan, Graham Fowell and Martin Rowson. 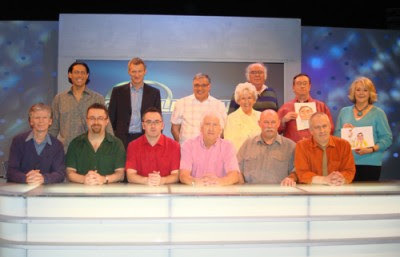 On the back row is presenter Jeremy Vine, second left, with the Eggheads, CJ de Mooi, Barry Simmons, Daphne Fowler, Chris Hughes, Kevin Ashman, and Judith Keppel, who was the Eggheads' sub on this show. 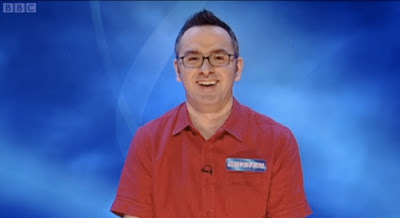 On each edition of the show a team of challengers are pitted against the Eggheads, who are all quiz specialists. Between them they have won most major TV and radio quizzes. And no, I can't tell anyone how we did. Sworn to secrecy, and all that!